As the Greek financial crisis within the Eurozone continues after last Sunday’s referendum and the appointment of a new Greek Finance Minister, and yet another deadline arrives today [7 July 2015], I came across this half-page feature in my cuttings. It was my last contribution to the ‘The Irish Times’ as a staff journalist 13 years ago, on 26 July 2002. Greeks proudly claim the drachma was Europe’s oldest currency, but five months after the euro became the only legal currency in Greece, few seem to regret its demise. Greeks have adapted rapidly to the changeover since the drachma was finally abolished on March 1st. “It’s easier, there are much fewer zeros involved,” one businessman told me last week. The drachma was often a difficult currency for tourists. Apart from the high number of zeros involved in calculations, in financially volatile periods, visitors could see a 20 per cent swing up or down in the value of their home currency against the drachma during an average trip. Now, after a determined struggle by the Greek government to stabilise the economy and become a full – if late – member of the euro zone, Greek euro-yearnings have been fulfilled. As the oldest currency in Europe, the drachma first appeared in the sixth century BC and was quickly adopted by the city states throughout the ancient Greek world. The Greeks named their unit of currency from the word drássomai, “to grip”, or “to take a handful”, and a drachma was originally worth a handful of arrows or a handful of grain. The drachma is mentioned in the Bible in both the Old Testament and the New Testament. Despite Roman efforts to take it out of circulation, the drachma continued as one of the major coinages of the ancient world and remained in circulation until Ottoman times. With Greek independence in the 19th century, the drachma returned after a lengthy eclipse, and was restored as the official national currency in 1833. But, at first, Greeks showed no confidence in the new currency: Turkish, Spanish and British notes and coins – even the currencies of defunct Italian city states – were more trusted, circulated widely, and began to supplant the drachma. Two moves saved the currency: a 60 million drachma foreign loan bolstered the state’s finances, and the National Bank of Greece was established in 1841 and put the first banknotes into circulation. Successive efforts to shore up the drachma ended with the outbreak of the second World War and hyperinflation. 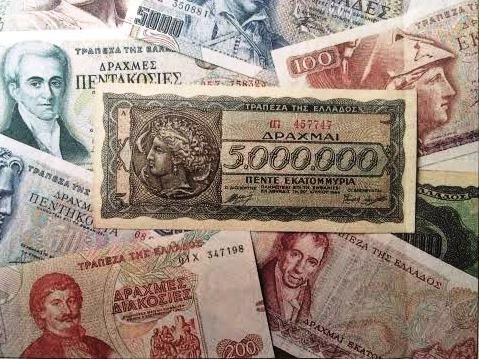 The drachma lost its value completely, and within 11 months the government released banknotes of 100,000, five million, 200 million, two billion, even 100 billion drachmas in a vain attempt to catch up with runaway prices. At the height of the crisis in late 1945, one British sovereign was worth around 70 trillion drachmas. The country’s real currency was sterling, and memories of that period have never faded – to this day, Greeks, especially in the islands and villages, dream of finding that “trunk full of sovereigns”. The drachma was often a difficult currency for tourists... and in volatile times visitors could see a 20% swing up or down in value of their home currency. Generations of Greek parents have used the drachma as a visual aid to teach their children about their classical, cultural and historical heritage: bankruptcies, wars and violent swings of government between monarchy and republic have given most heroes of Greek mythology and modern history a chance to appear on coins and banknotes. 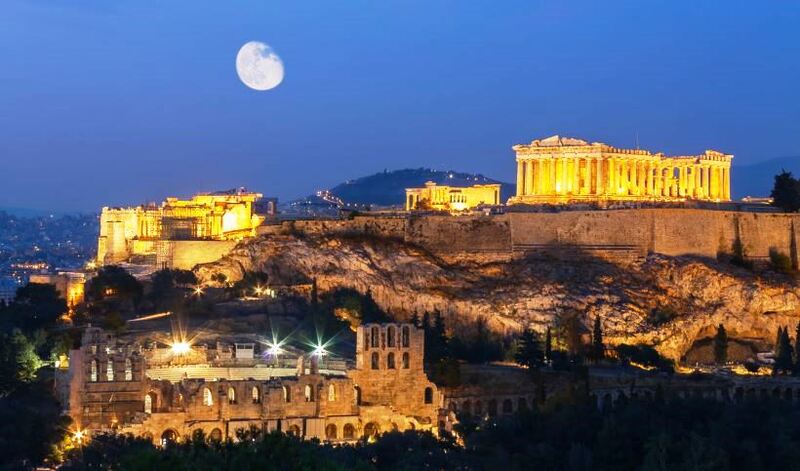 Until earlier this year, the lowest coin in circulation was 10 drachmas, which featured Demokritos, while Homer was on the 50 drachma coin and Alexander and the Star of Vergina graced the 100 drachma coin. Banknotes included mythical gods such as Poseidon (50), Athena (100) and Apollo (1,000); cultural figures such as Rigas Velestinlis-Pherios (200), along with the Monastery at Arkadia (500), the site of ancient Olympia (1,000); and the heroes of the independence struggle, including the seafarers (50), Korais (100), Kapodistrias (500) and Kolokotronis (5,000). Some of the heroes of the past survive on the new Greek euro coins, and the one euro coin replicates the Attic drachma with the owl, emblem of Athena, surrounded by a crown of laurels. The cent coins have also been given the Greek name “lepta”, recalling the sub-division of the drachma that hyper-inflation had forced from circulation many years ago. Greek financial institutions will continue exchanging drachmas for euros until the end of this month, and commercial banks will still exchange drachmas until the end of the year. And, if they have not become collectors’ items by then, the Bank of Greece will accept the old coins and notes until 2010.